World number one Michael van Gerwen stormed into the last 16 of the PDC World Championship with a stunning 4-0 demolition of Darren Webster. The Dutchman, aiming to regain the title he won in 2014, averaged 109.23, the fourth highest in the tournament's history, and hit 67% of his doubles. 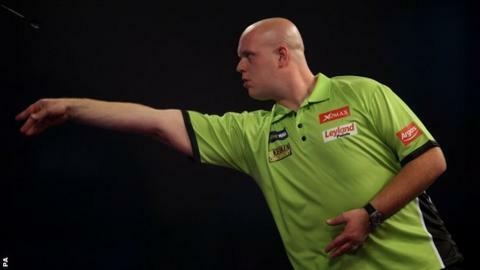 Van Gerwen reeled off 12 of 13 legs to book a meeting with compatriot Raymond van Barneveld at Alexandra Palace. The 2007 champion beat Stephen Bunting in a nail-biting final set to win 4-3. Van Gerwen, who has won all but one of the major televised events in 2015, was back in top form after surviving a scare against German Rene Eidams in the first round. "It was my goal to be good from the beginning to the end, and I played amazing," he said. "Everyone needs to look out for me now. "I always have fantastic games with Barney but with this performance, I will go into it with real confidence." Van Barneveld, also a four-time BDO champion, beat Bunting for the second consecutive year, having prevailed 5-4 in last year's quarter-finals. Englishman Bunting, the 2014 BDO champion, rattled in 15 maximum 180s but 48-year-old Van Barneveld - who became a grandfather overnight - held his nerve, nailing five 100-plus checkouts to progress. "That was one of the weirdest games of my career," Van Barneveld said. "I wasn't playing that well, and he hit so many 180s. He should probably have won - I was the lucky one tonight." James Wade, a three-time PDC semi-finalist, has yet to lose a set after enjoying a routine 4-0 win over fellow Englishman Wes Newton.